We know that choosing the right senior living options requires a lot of research and thought. That’s why we’ve put together a list of our most frequently asked questions about Otterbein SeniorLife. Whether you’re hearing about us for the first time or considering us for yourself or a loved one, our FAQ guide will give you more information and point you in the right direction. What does the term CCRC mean? Do I need to be United Methodist? Will I invest a large entrance fee? What is included in the services fee? Does the fee go up every year? Do I have to switch to Otterbein doctors? What are Otterbein Wellness Services? What happens if I can't afford care? What happens if my spouse needs health care before me? What happens if my health starts failing? What is Otterbein's pet policy? Do you accept veteran benefits? What will a typical week at Otterbein be like? If I'm not happy, am I stuck? How can I learn more about Otterbein? Otterbein SeniorLife is a vibrant, faith-based, not-for-profit ministry founded in 1912 that serves older adults throughout Ohio and Indiana. 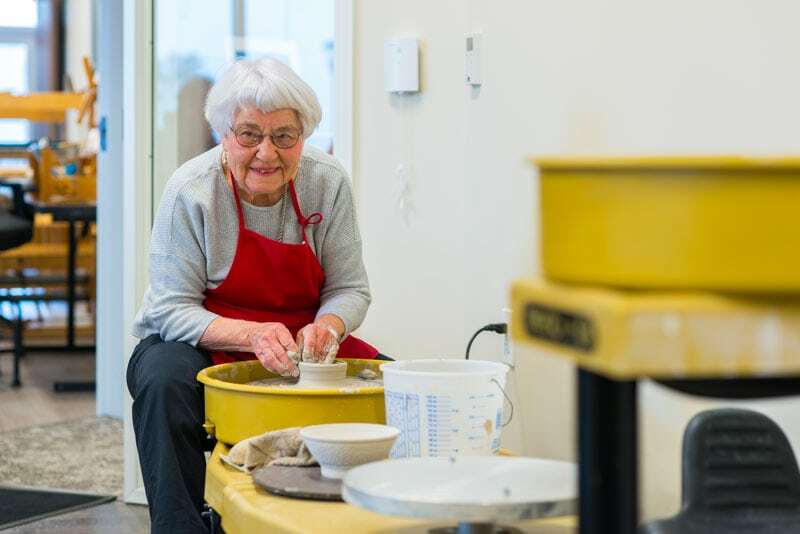 Otterbein provides a variety of lifestyle choices, including independent living, assisted living, skilled nursing and rehabilitative care, home health, and hospice. Our programs respect elders’ independence while enhancing their quality of life and holistic growth. What does the term CCRC mean? I see it frequently listed in describing this community. CCRC stands for Continuing Care Retirement Community and is a commonly-used description of lifestyle communities that provide a continuum of care - independent living, assisted living, skilled nursing and rehabilitative care - all in one community. I hear Otterbein is faith-based and associated with the United Methodist Church. Do I need to be United Methodist? No - Otterbein caters to residents of all faiths and beliefs. Is a community like Otterbein very expensive? Can I afford it? In most cases, living at Otterbein is no more expensive than the cumulative costs of living at your current residence. Ask your Otterbein contact to help you evaluate the cost comparison using our detailed worksheet. If I choose Otterbein, will I invest a large entrance fee or turn over my home and assets? No! Otterbein provides an array of payment options, including a standard month-to-month services fee with no required upfront investment. In no situation does Otterbein require you to turn over any of your existing assets, including your current home. You mention an array of payment options - what are they and how do I know which is best for me? Otterbein lifestyle counselors will work with you and provide you with data that an external financial consultant can use to help determine what’s best for you. In addition to an array of unique residences, each with unique costs associated with design, size, and location, Otterbein has three options for payments. A monthly services fee, with no up-front payment. A pre-determined “entrance fee”, determined by the design, size, and location of the residence you choose. This fee is 100 percent refundable to you should you choose to leave the community or move from independent living into health care (assisted living or skilled nursing), or to your estate in the event of your passing. Throughout the time you reside in independent living, the investment of the fee upfront yields a substantial discount from the monthly services fee, well in excess of the return you might yield from all but the riskiest investments. A RLUF (Refundable Life Use Fee). An RLUF is difficult to explain in short form but is a standard offering in the industry. In an RLUF, the resident selects an amount of money to invest upfront, and based upon the amount, the resident receives a credit against the monthly services fee for the duration of their residence at Otterbein. Any refund of the RLUF matures in a straight-line basis over 11 years; therefore, there is no remaining balance to refund 11 years. However, the credit lasts as long as you reside at Otterbein. If I invest in a refundable entrance fee, how do I know that my money is secure and Otterbein is financially stable? Otterbein is one of the largest not-for-profit senior living organizations in the country and has been in operation for over 100 years. Standard and Poor’s (S&P) assigned Otterbein an “A” investment rating, a mark matched by few other not-for-profit service providers in the country. Otterbein is stable and financially secure. What is included in the monthly services fee? The monthly services fee includes virtually all of the independent living services you would ordinarily fund - rent, interior and exterior maintenance (including all appliances), security, some transportation, and access to the wide array of activities and services. Some communities include meal plans; others have them available to you as reasonably priced options. Also included are a variety of hidden costs like property taxes and home insurance. Those who live at Otterbein say it is the best deal around! Does the monthly fee go up considerably every year? Otterbein is a not-for-profit entity but unfortunately is still subject to typical inflationary cost increases. Annual services fee increases typically range from zero-three percent annually, but feel free to ask your Otterbein contact for the recent history in your community. If I move to Otterbein, do I have to switch to Otterbein doctors? Most residents retain their current doctors - those with whom they have developed a trusting relationship. That said, should it be more convenient, Otterbein lifestyle communities have a medical director, clinic services, and ease of access to doctors on site. We also maintain relationships with hospitals and doctors throughout the local community. Otterbein’s goal is to help residents stay in their choice of residence as long as possible. To accomplish this goal, residents may have occasional or ongoing requirements for services that may be scheduled in advance. Wellness Services, available to Otterbein and local community residents, included clinic care, nurses, in-home care, personal care, homemaker services, companionship, transportation, and more. What happens if I move to Otterbein, run out of money and cannot afford care? People are living longer, more engaged lives, particularly in communities like Otterbein. In some instances, they have the good fortune - through no fault of their own - to outlive their assets. In these cases, for residents entering the community on a standard contract, Otterbein maintains a benevolent care fund. In more than 100 years, we have never asked a resident to leave as a result of funding issues. My spouse and I will move in as a couple. What happens if one us needs health care before the other? First, all Otterbein lifestyle communities provide access to Wellness Services, services performed in the independent living residence that are designed to allow each resident to age in place longer, delaying a move to assisted living or skilled nursing. Second, should one spouse require care that cannot be provided in independent living, the couple may remain together in the same community, albeit in separate residences depending on the level of care required. What happens if I move into an Independent residence and my health starts failing? Otterbein provides an array of options. If support can be scheduled, Otterbein Wellness Services are available to help with home and health care-based services. If you need more extensive support, Otterbein - in association with your doctors, family and you - is ready, willing, and able to help you make the transition to another part of the same campus. Can I bring my own furnishings with me? Absolutely, and Otterbein lifestyle counselors are ready to help you coordinate the move. Otterbein recognizes that meals are critical to a long and enjoyable life. That said, you’ll have plenty of dining options. All independent living residences include fully equipped kitchens for personal meal preparation; full-service restaurants with daily menus; and frequent resident events and activities with meal opportunities - both on and off campus. What is the Otterbein policy regarding pets? Independent living patio homes or villas allow pets (typically cats, dogs, birds or fish) of any size as long as you can ensure they are safe for other residents and on leashes in common spaces. Independent living apartments have restrictions, dependent upon community - ask your Otterbein lifestyle counselor for details. By the way, Otterbein Wellness Services provides dog walking, grooming care, and even medical care for pets, if needed. Absolutely, and many Otterbein residents are veterans. Work with your Otterbein lifestyle counselor if you need assistance applying or finding a contact. How do I know when the timing is right to move? Leaving behind the worries of home maintenance, feeling secure with your future health care decisions, and having a wide range of socially engaging programming every day makes life easier. Whether you are able to make the decision for yourself before your health changes, or an event forces a move, now is the ideal time ideal. What will a typical week be like if I move to Otterbein? People often comment they simply don’t have time to enjoy all the great social and educational opportunities Otterbein has to offer - musical groups, woodshops, art classes, chair yoga, swimming classes (at communities with a pool), book clubs, educational programs, and more. In addition, you can delight in bible study or church services...perhaps even lunch with a group of friends. You might find yourself tending to flowers, enjoying the community garden or catching a bass with the grandkids. We offer all types of social, educational, physical, and mental stimulation to make your week special. Some people find they like time relaxing with family or traveling for a special occasion. By leaving all the chores behind, you’ll have plenty of time in your week to do what YOU want. If I move to Otterbein and I’m not happy, am I stuck? Of course not! The Otterbein contract may be terminated with 30 days notice so you may leave and live closer to your family or another location. As a side note, our resident satisfaction rate is well over 95 percent, and very few ever make the choice to leave. Once you make friends and relish in the freedom from home worries, you will feel liberated, not stuck! People come to Otterbein for a wide variety of reasons, but once on campus, they discover a whole way of life - a way of life that exposes them to opportunities largely missing from their current lives. In fact, virtually every Otterbein resident wishes they had chosen to make the move years before. How can I learn more about life at Otterbein? Ready to take the next step? Schedule a tour at one of our locations throughout Ohio and Indiana and experience the Otterbein lifestyle for yourself.